Pandamensional Solutions, Inc., 9781938465055, 228pp. If there were an easy way for every newborn child to retire a multi-millionaire, wouldn't every parent want to know it? The concept is quite simple. From the moment your baby is born, you save $1,000 a year in a Child IRA until the baby's 19th birthday. Then you do nothing. If that money is invested for the long-term and earns 8% (which is 3% less than the average 11% long-term return for stocks), then, when that child retires at age 70, the Child IRA account would have grown to two-and-a-quarter million dollars. Don't you think parents want to know what they could do right now to allow their child to benefit from a Child IRA? Author Christopher Carosa thinks so. 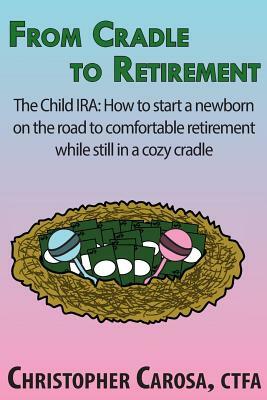 In From Cradle to Retirement, Carosa expertly pieces together these thoughts and interviews to reveal a practical "How-to" guide for parents, grandparents, and their financial advisers seeking to help young children reap the benefits of the Child IRA. Within this hands-on guide, Carosa weaves the fascinating history of the cultural views of retirement in America and the implications these have had on public policy. Finally, and perhaps of greatest interest, Carosa reveals real-world case-studies of people who have created actual Child IRAs for their children. It's harder today for parents to leave their children a better life, but this one simple tool all but guarantees you can.